Demonstrate your knowledge of the Webelos Arrow of Light requirements by completing this test. Click the small dot by the answer you choose. When you finish, you can print your results or email them to your den leader for tracking your progress. 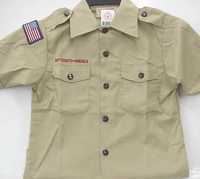 Which part of the Webelos uniform can not be worn as part of the Boy Scout uniform? How are Boy Scout rank badges displayed on the uniform? The lowest rank badge is at the top of the left pocket and higher rank badges are added under it in order. The highest rank badge is displayed on the left pocket with pins for each lower rank ordered under it. Only the highest rank badge is displayed on the left pocket. Each rank badge is displayed in its pre-labeled position on the Boy Scout rank sash. Which of these knots is a square knot? Which is NOT a significant part of the First Class Scout badge? Which is the Boy Scout Motto? Which is the Boy Scout Slogan? 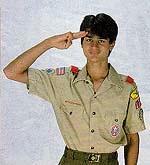 How many fingers are pointing straight when you give the Boy Scout salute? Which best describes the Boy Scout handshake? What do the stars on the First Class Scout badge stand for? What do the three points on the First Class Scout badge design stand for? Which part of the First Class Scout badge represents the Scout Slogan? This was hard but fun at he same time. This was a great test and also a good learning experience. that was so easy but hard in a good way. I thought it was going to be so hard I could not finish it. I just believed so I got it done today in about 10 minutes. Perfect Score. However, nowhere is this a requirement for the Arrow of Light. So not make boys take this test. On questions 3 and 4 you state "Boy Scout" not "cub scout". 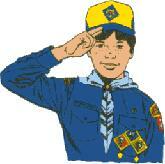 If you're asking questions about Webelos, shouldn't you use the word Cub Scout not Boy Scout. Different uniforms and you mention merit badges. Cub Scout Webelos do not earn merit badges, they are called pins. @Wendy - You might check out the requirements for the Arrow of Light Scouting Adventure to see how these questions could help.